For those with an interest in both Owls and Raptors (eg. 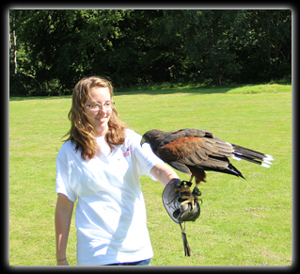 Hawks, Buzzards & Falcons), our Mixed Hour Experience is tailored precisely for you! 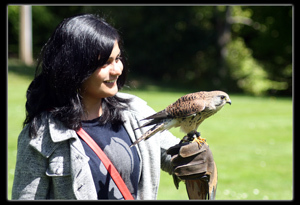 You will learn to handle and fly either one of our smallest or largest of our Owls, the decision of which is up to you, and either a Harris' Hawk, Common Buzzard or Kestrel, whilst taking in the scenic grounds of the Dalhousie Castle Hotel & Spa. All training and equipment is provided. Get up close and within talon reach to these magnificient Birds of Prey whilst learning the differences in both flight and nature between the Owls and Raptors whilst also gaining a "hands-on" experience of a life time! 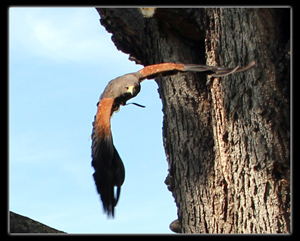 The Hawk will fly free and will follow you wherever you walk, swooping back onto the fist when called; the Owl will fly gracefully from arranged perches and trees to your fist. We are sure that you will find our Mixed Hour a truly amazing experinece - an experience you will not forget! 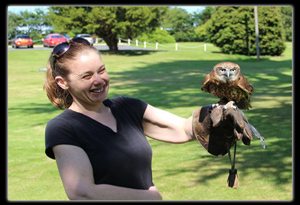 Please note that if there is a particular Owl or Raptor you would like to meet, handle, fly and learn about, please notify us when you book. This will also help us to tailor to your every need so we make your experience even more enjoyable. Our Mixed Hour Experience is available on a pre-booked basis only and lasts 1 hour. For further information or to discuss your needs, please contact us, thank you. The Children's Activity is designed for children 12 years old and younger. The activity lasts for 45 minutes and during that time they will be introduced to all of the birds, then they will fly 1 small owl; normally one of our Barn Owls or Boobook Owl and hold another bird such as a Kestrel. Thank you for choosing to purchase a Mixed Hour Experience Gift Voucher! These make an ideal gift for birthdays, christmas presents or purely as a gift to someone with an interest in both Owls and Raptors! Please note: Gift Vouchers will be sent to the account holder only. Please note: Purchasing a gift voucher is not a form of booking your chosen experience as we may not be able to guarantee the specific date that you want to partake in your experience due to other bookings that we may have already booked in, however we try our up most to facilitate your needs. We will send you your Gift Voucher via post, unless you have asked us to send you an E:Gift Voucher, which is an electronic version of our Gift Vouchers which is sent to you via email. In order to book a date for your chosen experience, please either call or email us. To make payment, simply click on the "Buy Gift Voucher" button below. There is an additional charge of 3% to cover costs of processing your payment via PayPal - this will appear as P&P. Thank you for choosing to purchase a Children's Activity Gift Voucher! These make an ideal gift for childs birthday, christmas present or purely as a gift to children who have an interest in Owls and other Birds of Prey!